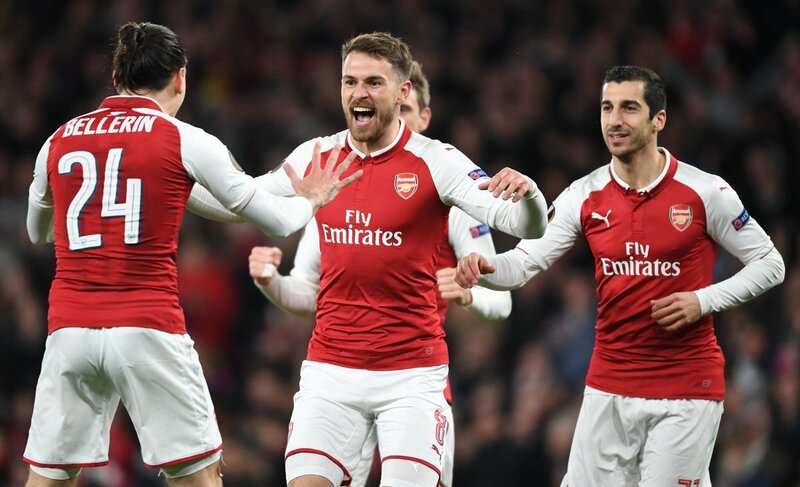 A brace each from Aaron Ramsey and Alexandre Lacazette helped Arsenal take a commanding 4-1 lead in this Europa League quarter-final first leg. Arsenal’s biggest European match in years got off to an exciting start. CSKA Moscow saw a lot of possession but were wasteful moving forward. 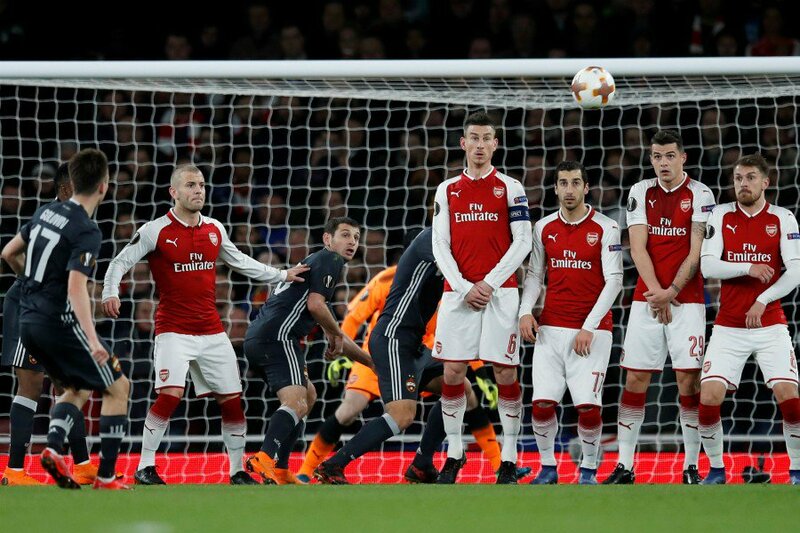 The Gunners took a chance to break and Aaron Ramsey had the ball in the net but the goal was ruled out after Mesut Ozil was deemed to be offside in the buildup. The home side didn’t have to wait long for another chance. This time, Ozil dropped deeper and after a one-two with Jack Wilshere, played it out wide to Hector Bellerin. The Spaniard took his time before cutting it to the back post for Aaron Ramsey to make it 1-0. The Gunners were flying and looked determined to open up this ageing CSKA defence. But things didn’t last as Laurent Koscielny made the mistake of over-reaching for a header and conceding a free kick 25 yards from goal. The impressive Aleksandr Golovin stepped up and whipped it into the top corner of the net to equalise. Arsenal needed to respond and didn’t waste time. Mesut Ozil broke into the box but was brought down. The referee wasted no time before pointing to the spot and just as he did on Sunday, Alexandre Lacazette stepped up to convert the penalty. 2-1 soon became 3-1. Mesut Ozil was again pulling the strings from deep as he played a ball through for Aaron Ramsey. The Welshman had burst through midfield and with enough time for just one touch, had the presence of mind to flick it over Akinfeev’s head and into the net. The Gunners weren’t finished there. Mesut Ozil was at the heart of yet another dangerous attack which resulted in Alexandre Lacazette picking the ball up just inside the opposition box. The Frenchman controlled it well before unleashing a fine strike into the bottom corner. The chances continued to flow for Arsenal after the break as Alex Iwobi, Mesut Ozil and Danny Welbeck all had opportunities to make it four. 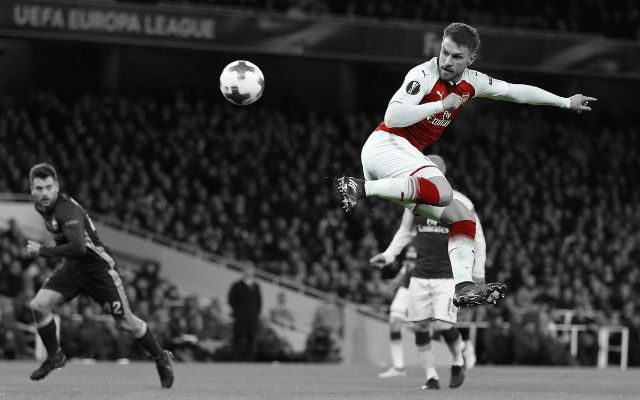 Aaron Ramsey came close to grabbing his second hat-trick of the season but clipped the outside of the post with a fine curling effort. But the Gunners must have been content with the scoreline. The second 45 minutes was all about control for the home side as they kept the ball and ran down the clock to take a 4-1 lead to Russia for the second leg. Petr Cech didn’t have a great deal to do this evening. 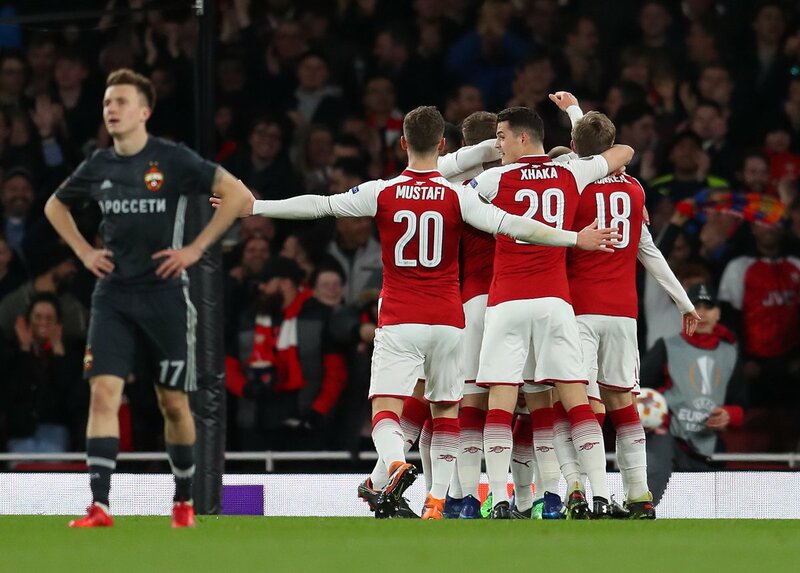 The stopper could do little to prevent Aleksandr Golovin’s freekick but saved everything else which came his way. Hector Bellerin had a fine game offensively. The Spaniard’s final ball was excellent but he was caught out defensively on more than on occasion. Shkodran Mustafi has played better. His defensive positioning was poor at times and it would’ve been punished more severely against better opposition. Much like his centre-back partner, Laurent Koscielny didn’t have the best match of his career and the Gunners would’ve conceded more against better opponents. A quiet one for Nacho Monreal. The Spaniard wasn’t really utilised moving forward but was solid enough at the back. A wonderful attacking performance from Aaron Ramsey. The Welshman’s late runs into the box were often left untracked but the midfielder really took advantage of it. He scored that vital first goal before that wonderful strike to make it 3-1. He did well. Granit Xhaka was the deepest of the midfield three but that didn’t prevent him from stringing passes together in the attacking third. He wasn’t the busiest player in this Arsenal attack but Henrikh Mkhitaryan played well. The Armenian tracked back well in the first-half and got on the end of a couple of opportunities at the other end. A decent performance was cut short by injury. He did okay. Alex Iwobi looked lively after coming on as a sub. Jack Wilshere did okay. The Englishman didn’t see a great deal of possession in the attacking midfield position. His touch looked a little off at times but grew into it. Looked lively and saw a lot of possession. A wonderful performance from Mesut Ozil, particularly in the first-half. The German was at his best as he controlled possession from deep. Ozil crafted some wonderful opportunities for his teammates on the night and was at the centre of almost every Gunners attack. Alexandre Lacazette can be pleased with his evening. The Frenchman grabbed two important goals to add to his tally since returning from injury and looked sharp throughout. It bodes well for the Gunners. Danny Welbeck did well after coming on but perhaps should’ve scored his big chance.